Delight your taste buds and expand your culinary experiences in The Gambia. 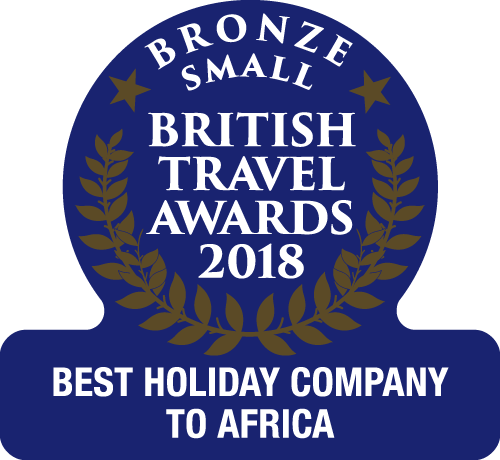 When visiting The Gambia, you'll find a huge choice of restaurants to suit every palate including Italian, Indian, Chinese and Lebanese, as well as international restaurants selling everything from a full English breakfast to fillet steak with peppercorn sauce. 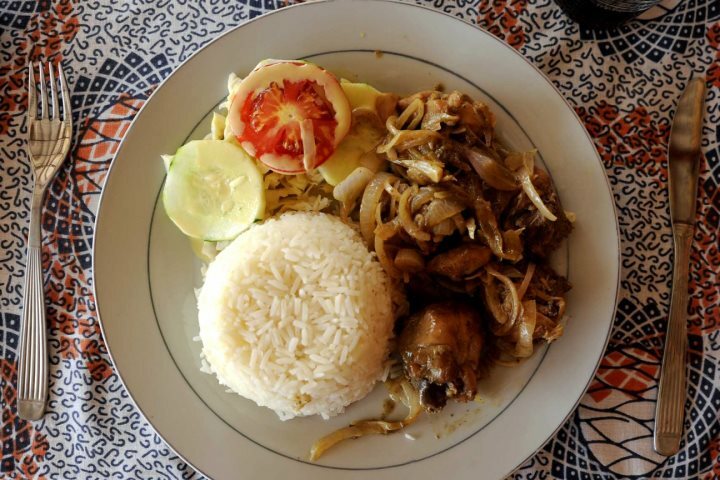 I’m a firm believer, however, in getting to know a country through its food and I’d recommend everyone visiting The Gambia for the first time, at the very least, to try one or two traditional dishes. You’ll often see them featured on menus plus there are a few restaurants that specialise in local cuisine. The most common food served in a Gambian home is white rice with any one of a number of spicy sauces. Domoda is the most popular dish in my experience, in fact I was once offered it three times in one day. As much as I love it, I could not do the third meal justice but it would have been rude to say, no thank you. 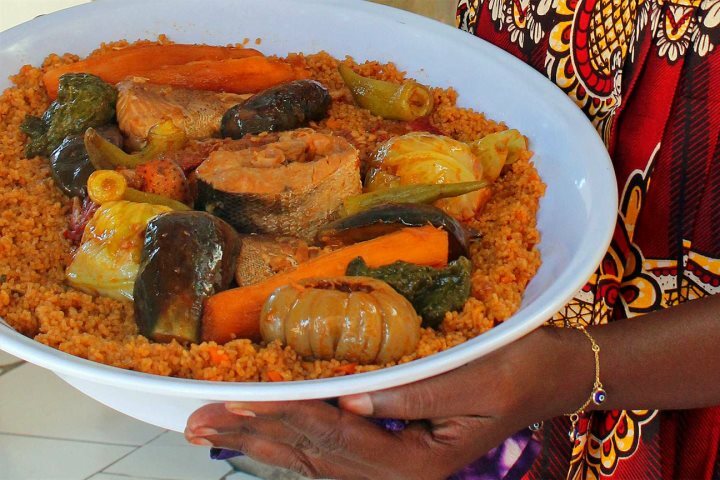 It is traditional in The Gambia to all gather round one large bowl of food with each person eating from the part of the bowl immediately in front of them, using their right hand. If you get invited into a Gambian home to share a meal it is perfectly acceptable to ask for a spoon to eat with. Any meat, fish or vegetables that have been left whole may be broken up, again using your right hand (or spoon). Your host will often do this and then toss part of it into your section of the bowl for you to eat. The following is a list of some of the common local food and drink that I have come across but I’m sure there is plenty more that I’ve yet to discover. Afra is a very popular late night snack. Typically you’ll select your choice of meat which will be chopped up in front of you, seasoned and grilled then served with mustard or a spicy sauce, however, in my experience at least, the quality can vary greatly. Akara (pictures above) is a delicious local dish served for breakfast sometimes in tapalapa bread. It’s made from black-eyed peas, grounded into flour and deep-fried. I first tried it and loved it at Ngala Lodge where it was served with an onion, chilli and Jimbo (seasoning) sauce. You’ll also find them on the breakfast menu at some other hotels including Kombo Beach Hotel which offers a daily Gambian breakfast specialty. 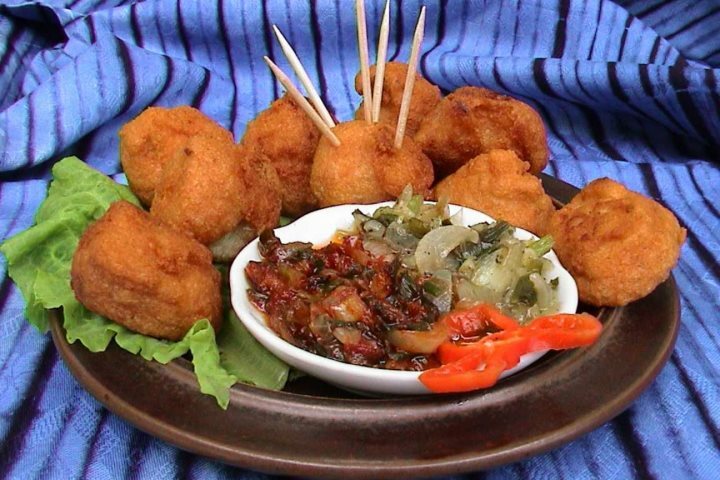 Akara is a favourite but others include Oleleh and Abala, street food snacks, again made from black-eyed peas, and traditionally come wrapped in a banana leaf. Made from the fruit of the giant baobab trees, this pale brown, non-alcoholic drink is delicious and good for you, being full of vitamins, calcium and fibre. It’s also probiotic I’m told, so stimulates good bacteria. It’s worth noting that you can now buy it in health food shops in England in powder form and people use it in various ways including flavouring yogurts and smoothies. Benechin literaly means ’one pot’ and can be cooked with chicken or other meat but fish is probably the most common variation. I’ve made this with Ida Cham who runs cooking classes. Before the class we headed to the beach not for a swim but for the fish market. Ida selected a John Dory fish and a Red Snapper. She also used a small amount of dried salted fish for extra flavour. While the fish sellers scaled and gutted the fish, we bought other ingredients including tomatoes, carrots, spring onions, sweet potatoes, onions, aubergine, cassava, bitter tomatoes and butternut squash. Chilli is also an important ingredient. This dish is also referred to as Jollof rice. Visit our excursions page on our website to find out more about Gambian Home Cooking with Ida. This peanut-based dish is probably the most cooked dish in The Gambia and comes served with white rice. Domoda is made from peanuts with tomato paste, mustard, black pepper and onions. Also known as Superkanja, this stew is made with beef, fish, onions and, of course, okra and sometimes prawns or crabs. Made by collecting the sap from the top of certain palm trees, this cloudy white drink can vary from a sweet and mildly alcoholic drink when freshly collected (especially from a tree that hasn’t been tapped before) to a sour and much stronger drink, after the sap has been allowed to naturally ferment for a few hours. It gets stronger over the nest day or so but if left too long turns into vinegar. This bread looks much like a French stick and is commonly eaten for breakfast with jam. A delicious and refreshing non-alcoholic drink made from dried hibiscus (sorrel) flowers and sugar. This is another common dish that you’ll often find on restaurant menus, usually in the form of Chicken Yassa. The chicken is cooked with chillies, lime, onions and mustard and a stock cube of Maggi © cubes, a popular ingredient in the Gambia. Variations that you’ll sometimes find include beef, fish, prawn or vegetable. Twice a week in the Winter you’ll find a demonstration of Gambian cooking at the Kombo Beach Hotel but if you want a more hands-on experience try Ida Cham’s cooking class - a visit to a fish market is followed by a morning spent cooking and chatting in Ida’s courtyard and then tucking in for lunch. I’ve been a couple of times and thoroughly enjoyed it on both occasions. More details on Ida’s cooking class and other excursions can be found on our website, Excursions and Experiences. Do you have a favourite traditional Gambian food or drink or a favourite place to buy it? A warm and sunny welcome from all of us at Ngala Lodge in The Gambia! Senegal... a whole new experience awaits! Countdown of our favourite views in The Gambia! 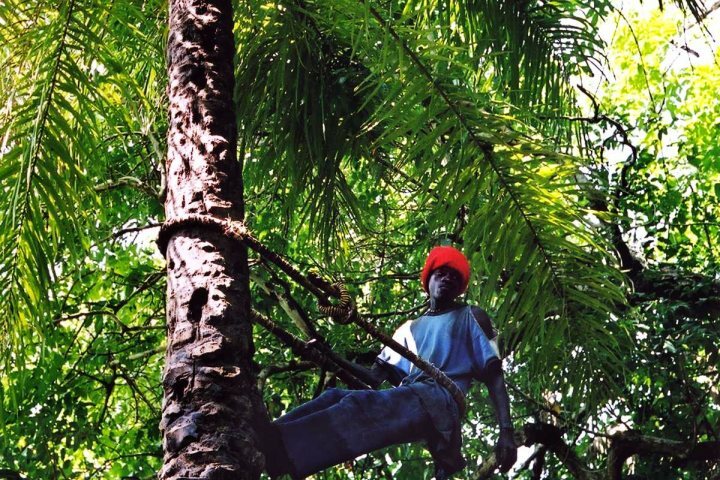 Could The Gambia be your ideal honeymoon destination? When to go to The Gambia? Why is April a great time to visit Mandina lodges? The British Travel Awards: what do our customers think?